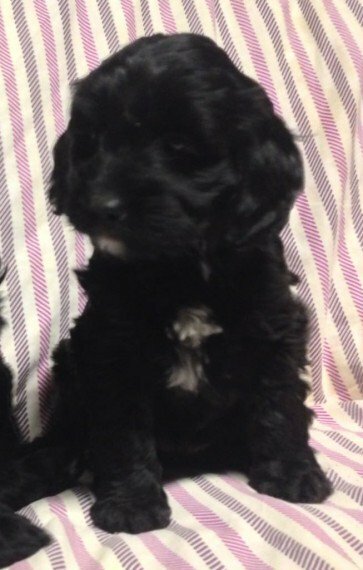 We have three of the most georgeous toy cockapoo puppies ready for there new adventures. there is one boy and two girls . mum is our lovely cocker spaniel BOW whilst dad is our friends toy poodle OTIS . they have been wormed every two weeks. frontline flea treated. they have had there first vaccinations and health check . and are microchipped .they have been reared on a premium diet of minced beef . free range eggs. goats milk and quality kibble. they have lovely soft. thick . waves.curly coats that are minimal.non ahead making them ideal for Athsma. allergy sufferers. they will come with a small bag of kibble and a portion of minced beef . any questions feel free to call .